Enjoy twinkling lights, seasonal decorations and fun traditions in these charming locales. 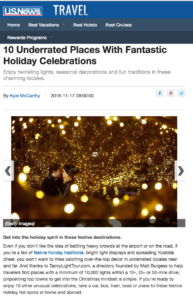 Get into the holiday spirit in these festive destinations. Even if you don’t like the idea of battling heavy crowds at the airport or on the road, if you’re a fan of festive holiday traditions, bright light displays and spreading Yuletide cheer, you won’t want to miss catching over-the-top decor in underrated locales near and far. And thanks to TackyLightTour.com, a directory founded by Matt Burgess to help travelers find places with a minimum of 10,000 lights within a 10-, 25- or 50-mile drive, pinpointing top towns to get into the Christmas mindset is simple. If you’re ready to enjoy 10 other unusual celebrations, take a car, bus, train, boat or plane to these festive holiday hot spots at home and abroad.